WESQ is excited to be leading the chamber music program for Wesleyan University in Middletown, Conn. The Fall 2016 Wesleyan Chamber Music class after a performance at Heritage Commons Retirement Home in Middletown, CT.
WESQ is pleased to announce a new series of masterclasses at The Hartt School, featuring students of the Hartt Community Division chamber music program. Masterclasses are free and open to the public. All masterclasses start at 7:00 pm and will be held at The Hartt School. In the spring of 2011 WESQ collaborated with Rhymes With Opera to present Criminal Intent: a triple bill of crime operas and questionable morals. RWO's mission is to present new opera in unconventional spaces, creating new connections between the work, the place where it is performed, and the audience. This tour of the Northeast includes shows in Baltimore, New York, Hartford and Boston. Baltimore composer David Smooke's opera CRIMINAL ELEMENT is about a rogue trader in France who nearly brought down the entire European financial system in 2008. RWO co-director and composer George Lam's SOMEONE ANYONE tells the story of a woman who is offered the chance to leave her life of crime. In ORPHEE REDUX, composer Ryan Jesperson reimagines the story of Orpheus, set in the seedy underbelly of New York City. In addition to these short operas, the WESQ will perform a set of new works to complement the program. 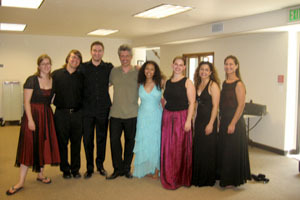 For more information about RWO, visit www.rhymeswithopera.org. In the summer of 2010 WESQ participated in the Professional Studies program at Soundfest, the chamber music festival hosted by the Colorado String Quartet at Falmouth Academy on beautiful Cape Cod. This intensive two-week festival was filled with rehearsals, coachings and concerts. We worked closely with the Colorado Quartet, studying with them, teaching high school and middle school ensembles, and performing the Dohnanyi string trio on the final concert. Commission 2006 by Ruby Fulton "The Slow Revolution"
This commission was supported by an Encore Grant from The American Composers Forum. The grant is to encourage ensembles to work with composers and to help pay some of the costs associated with concert production. We were able to present the piece in Hartford, CT, Baltimore, MD and Farmington, ME as a result. And to also add an interesting new piece to the String Quartet Repertoire. Inspired by a story on NPR, the Slow Revolution has come about by the pace of modern life, and one mans attempt to slow down and enjoy the things that really matter in his life. The piece is in three movements: Slow Panic, Inyourfacenessigheit (translated very very much in your face), Inner Tortoise. 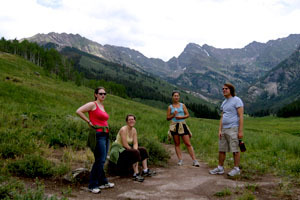 In 2007, WESQ spent a whirlwind three weeks in Colorado at the Bravo! festival giving concerts (17 of them! ), rehearsing, and enjoying the occasional hike. The quartet was delighted to perform with artists including members of the Amelia Piano Trio and the Rossetti String Quartet, as well as solo artists Eugenia Zukerman, Jennifer Koh, and Stefan Milenkovich, among others. Performing highlights from the festival include Mendelssohn's Octet in E-flat, op. 20, Dvorak's Serenade for Strings, and Debussy's Quartet in g minor, op. 10.